Initiated 1999 year by Srila B P Puri Goswami Maharaja and happy by that. My best place I ever like to stay. My home. gauravirbhava-bhumes tvam, nirdestha saj-jana-priyah vaishnava-sarvabhaumah shri-jagannathaya te namah "I offer my respectful obeisances to Jagannatha dasa Babaji Maharaja, who is respected by the entire Vaishnava community and who discovered the place where Sri Chaitanya Mahaprabhu appeared." Sri Jagannatha Dasa Babaji Maharaja was born in the Mayamansingh district of West Bengal. Gaudiya Vedanta-acharya Sri Baladeva Vidyabhushana had a disciple named Uddhava das. His disciple was Sri Madhusudana Dasa Babaji who lived in Suryakunda. Madhusudana Dasa Babaji's disciple was Jagannatha Dasa Babaji Maharaja. Jagannatha Dasa Babaji lived in Vrindavan and performed his bhajan there for quite some time. He became famous among the devotees there as one who was perfect in Krishna-bhakti. In 1880, Srimad Bhaktivinoda Thakura went to Vrindavan and saw his lotus feet for the first time. While there, he received many divine instructions on Hari-bhakti from Jagannatha Dasa. Some time later, Babaji Maharaja visited the Barddhaman district during the month of Phalgun. 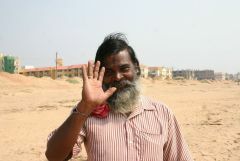 He stayed at a town called Amalajorha. At that time, Bhaktivinoda Thakura again had the good fortune to take darshan of his holy feet. Seeing Bhaktivinoda Thakur's enthusiasm for preaching the holy name of Krishna, Srila Babaji Maharaja was very happy. He stayed in Amalajorha during ekadashi, and that night there was kirtan and Hari-katha. Later, at Amalajorha, Srila Bhaktivinoda Thakura established his Prappana-Ashram. 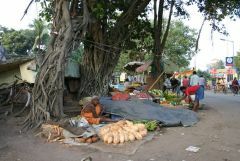 In 1893, Srila Babaji Maharaja went from Koladwip (the part of Nabadwipa where Srila Sridhara Maharaja's temple is presently located) to Surabhi-kunja in Godrumadwipa. There he took his seat. His arrival in Surabhi-kunja was a wonderful event. 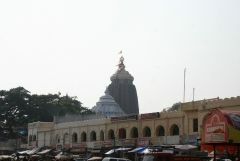 Sri Jagannatha Dasa Babaji revealed many lost holy places in Mayapura, including the Yogapith, Srivasa Angana and others. It is said that when he came upon the holy place of Mahaprabhu's birth he danced, although he was very old and walked with difficulty. For some time he remained in Nadia and performed his bhajan on the banks of the Ganges. His bhajan kutir and samadhi mandir are still there at present. 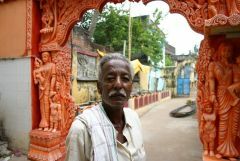 He ordered Bhaktivinoda Thakura to build a hut so devotees could stay near his bhajan kutir, and Bhaktivinoda did so. When Srila Bhaktisiddhanta Saraswati Thakura was twelve years old, he was an expert in the Jyoti-shastras explaining Vedic astrology. Hearing this, Srila Babaji Maharaja one day called upon him to prepare the Vaishnava calendar in accordance with the proper siddhanta. He did so and Babaji Maharaja was very pleased. With this, the Nabadwipa Panjika, the Vaisnava calendar recording the dates of the appearance and disappearance of important Vaishnava saints and the celebration of important festivals, began. Srila Babaji Maharaja always had great enthusiasm for kirtan and Vaishnava seva. Even when he was nearly 135 years old, he went on preaching the message of Sri Chaitanya throughout the world for the benefit of the fallen masses. In his old age, although he was almost paralyzed by infirmity, whenever it was time for kirtana he would still raise his arms in ecstasy. Jagannatha Dasa Babaji Maharaja was the veda or Babaji guru of Bhagavat dasa Babaji Maharaja. Bhagavat dasa in turn gave the dress of a babaji Gaurakisora dasa Babaji. Jagannatha dasa Babaji's servant's name was Bihari dasa. He was extremely strong and powerful. In his old age, Babaji Maharaja could not walk. Bihari dasa used to carry him in a basket on his shoulders so that Babaji Maharaja could move from place to place. When he went to Calcutta, Babaji Maharaja would stay at the house of Bhaktivinoda Thakura on Manikatala Street. Bhaktivinoda was always very eager to invite him to his house for prasada, but Babaji Maharaja was very renounced and would come only occasionally. When he was in his old age, Babaji Maharaja was nearly blind. 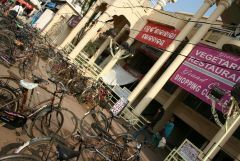 Many people would come to see him and to offer him donations for the service of Sri Krsna. His servant Bihari dasa would keep all these donations in a bag. One day, Babaji Maharaja said, &#8216;Bihari! How many rupees have I got?' Bihari dasa had put some rupees aside for some service he had planned to render Babaji Maharaja. When asked by Jagannatha dasa Babaji about how many rupees were on hand, Bihari placed some rupees in his hand and kept twelve Rupees aside. Even though his eyesight was failing, however, Babaji Maharaja detected the discrepancy. 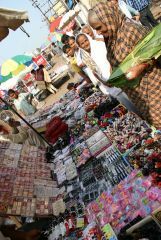 &#8216;Bihari!&#8217;, he said, ?Why have you kept twelve Rupees aside? Give me all the rupees!? Smiling at this fun, Bihari surrendered the remaining coins to his guru. At that time, Babaji Maharaja made his wishes known as to how the money should be spent. The total came to two hundred rupees. Babaji Maharaja ordered Birari dasa to take the money at once and buy sweetballs, rasagolas, to feed all the cows in Nabadwipa dhama. 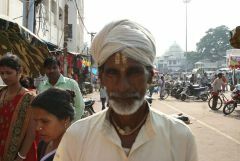 Once Babaji Maharaja was on the banks of the Ganges, living under a makeshift canvas tent. Nearby that place there lived a dog with five puppies. Whenever Babaji Maharaja would take prasada, the dogs would come around and lick the food from his plate. When Bihari dasa caught hold of one of the dogs to drive it off, Babaji Maharaja told him, &#8216;Bihari! If you wish to drive these dogs off, you may take my plate away as well. I shall not eat today? When Bihari complained, ?But guru maharaja - these dogs are unclean!? Babaji Maharaja remarked, ?No. These dogs are residents of the holy dhama. You may not abuse them!&#8217; Many people used to come and beg alms from Jagannatha Dasa Babaji. He did not want to give them alms, but told them to do service. One day a man named Sri Gaura Hari dasa came and asked Jagannatha Dasa Babaji Maharaja for alms, but Babaji Maharaja would give him nothing. When the man persisted for three days, fasting outside Babaji Maharaja's tent, Babaji Maharaja finally relented. He tore off a piece of his kaupina, his undergarment and gave it to Bihari dasa, his servant, with the instruction to present it to the beggar as alms, thereby informing the beggar that he must first learn to control his senses before taking up the profession of a saint. One day, Sri Babaji Maharaja remarked about the professional readers of Srimad-Bhagavatam, ?This kind of professional Bhagavata kirtana is simply prostitution. Those who make their living by reading Srimad-Bhagavatam are offenders to the holy name of Krsna. No one should listen to the kirtana and Bhagavatam readings that they produce. And one who listens to such offensive readings and thus commits offenses against the holy name of Krsna certainly go to hell. Those who are involved in this professional reading should immediately give it up. Such a person should worship the residents of Vrndavan with great care and attention, considering himself most fallen, and thus pray for forgiveness.&#8217; Srimad Bhaktivinoda Thakura remarked of Srila Jagannatha dasa Babaji Maharaja that he was the topmost general among Gaudiya Vaisnavas. Pretentious devotion by Srila B.B.Bodhayan Maharaj, president-acarja of Sri Gopinath Gaudiya Math All glories to Sri Guru, Sri Gauranga and the Brahma Madhva Gaudiya Saraswata Sampradaya! It is sad to say that in our contemporary Gaudiya Vaishnava community, many of us are Vaishnavas in name only. We make a show of devotion, but what we are calling devotion is in fact the observance of few rules of moral behavior at best. In essence, it is thus not devotion at all. Moreover, in the name of pure devotion, we are also abusing the ideal of yukta vairagya, renunciation with proper adjustment to time, place and circumstances. We are not supposed to be followers of Ekalavya, who was rejected by even his own guru Dronacharya. We must take stock of our true standing on the bhakti marga? Service to the spiritual master is based on surrender, and not on just following a few moral codes. Service to the guru means following the pure devotional path according to his instructions. It goes beyond morality. Krishna proved this when He instructed Arjuna to kill his own kinsmen. Krishna told Arjuna: "Do it! You will not incur any sin. I shall protect you." It was not "moral" to kill Dronacharya, Bhishma and all the other great and pious heroes fighting for the Kauravas, but Arjuna surrendered to Krishna, his guru. He thus surpassed the mundane principles of morality, which involve following rules and regulations to keep peace and order in human society. We must not neglect the instructions of our diksha guru. For, if we are not surrendered, we cannot actually render any true service to Krishna. Srila Bhaktisiddhanta Saraswati Thakur Prabhupada gave us the proper conception of yukta vairagya for our present times. We should try to understand it properly if we are to serve the cause of Sri Chaitanya Mahaprabhu. Surrender to Krishna gives life In the Bhagavad-Gita (18.66), Sri Krishna told Arjuna, "Abandon all varieties of religion (sarva-dharman) and take exclusive shelter of Me. I shall deliver you from the reactions of your sinful activities. Do not fear." Sarva-dharman indicates "all kinds of religious attitudes." This means that we must without hesitation reject all other methods of spiritual advancement other than surrender. Srila Rupa Goswami also recommends that we cultivate devotion free from personal interests (an yabhilasita-synyam) and the tendencies toward karma and jnana (jnana-karmady-anavritam). Surrender is the primary characteristic of bhakti. It cannot be found anywhere else. Other attempts to reach the Absolute by adopting the path of karma yoga or jnana yoga, for example, are destined to disappoint us. Saranagati, or surrender to Krishna, is the name Srila Bhaktivinoda Thakur gave to a collection of wonderful songs of his own composition. In the introductory song of that book, Bhaktivinoda writes, srI krishna caitanya prabhu jive daya kari sva-parsada sviya dhama saha avatari atyanta durlabha prema karibare dana sikhaya saranagati bhakatera prana "Out of compassion for the fallen souls, Sri Krishna Chaitanya came to this world with His personal associates and divine abode to teach sharanagati, surrender to Krishna, and to freely distribute ecstatic love (prema) for God, which is ordinarily very difficult to obtain. This sharanagati is the very life (prana) of the true devotee." This song clearly says that without surrender, a devotee is without life (prana). Surrender to guru, Vaishnavas and Krishna will give us back our life. We have nothing to lose. This is the benefit of the bhakti process. On the other hand, if a person has a good character, but no devotion, he can be considered a moralist at best. The soul gives life to the body, which is otherwise dead. Similarly, a life of so-called devotion without surrender is like a useless corpse. It is impossible to achieve divine love (prema) without surrender. In this regard, we can learn a good lesson from the famous story of Ekalavya. The story of Ekalavya Once, when Arjuna, the celebrated Pandava, was still a boy, he, his brothers and his cousins studied the military sciences from the great master Dronacharya. At that time, Ekalavya, the son of Hiranyadhanu, the king of an aboriginal tribe, was moved by his faith to approach Dronacharya and request him for instruction in archery. Dronacharya refused to teach his prospective disciple because he wanted to test his faith, but Ekalavya was stubbornly determined to learn archery from the master. So unbeknownst to Drona, Ekalavya went to the forest and fashioned an image of him out of clay. He then began to practice archery in front of this image all day long. Concentrating his mind on Dronacharya in this way, Ekalavya gradually became the most expert archer in the world, more skilful than even Arjuna. Arjuna was not only Krishna's intimate friend, but also Dronacharya's dearest disciple. The master had once promised him, "No one will ever excel you in this art. You will become the best archer on this earth and so will you remain, I promise you!" One day, the Kauravas and the Pandavas went together for a walk in the forest when they suddenly saw something quite astonishing. Lying peacefully on the ground was a dog whose mouth had been sewn closed by seven arrows. The boys thought that one who could perform such extraordinary feat was undoubtedly the best archer in the world. They also thought that perhaps he was even better than Arjuna. As they continued to penetrate deeper into the dense forest, they came across an unknown archer tirelessly practicing his marksmanship. It was he who had shot the arrows at the dog because the animal had been barking and disturbing his concentration. When the boys returned to the palace, they related the incident to Dronacharya in detail. Arjuna humbly reminded Dronacharya of his promise that no one would ever excel him in archery. Dronacharya, who was very surprised to hear of the existence of such an expert bowman, went to the forest with Arjuna to meet him. When they reached Ekalavya's cottage, they saw him sitting down before the clay image of Dronacharya and shooting arrows with great expertise. As soon as Ekalavya saw them, he paid them their due respects, honoring Dronacharya as his master. When Dronacharya heard that Ekalavya considered him to be his guru, he requested dakshina from him. Dakshina is the donation or gift given to a priest or one's own guru. In ancient times, masters used to demand their due dakshina from their disciples at the time of initiation. Ekalavya stood with folded palms in front of Dronacharya, and told his master that he was ready to do whatever he ordered. Dronacharya then demanded that Ekalavya give him the thumb of his right hand. Though the loss of the thumb meant that he would no longer be able to shoot, Ekalavya cut it off without hesitation. A dangerous example Srila Bhaktisiddhanta Saraswati Thakur explains that Krishna, bhakti and the bhakta partake of the same absolute nature. A devotee enjoys a special position because the Lord is favorably inclined to him. On the other hand, a non-devotee may have many good qualities and moral virtues according to the standards of worldly life, but all these assets have no value in the eyes of the Lord. Any one who thinks that morality surpasses bhakti will fail to catch this subtle point. Though Ekalavya had initially been rejected by Dronacharya, he was moved by his own faith to make an image of clay of his master. He had then achieved perfection in archery by practising in front of that image. This seems to be an example of devotion to the master. Indeed, it seems that Ekalavya was completely surrendered to his guru. Otherwise, how could he cut away his thumb without thinking twice? However, it is my humble opinion that a devotee on the path of surrender must dismiss the example of Ekalavya. When Dronacharya refused to instruct Ekalavya in archery, he had good reasons for not doing so. Ekalavya should have waited for his guru's mercy, but he did not. Instead he concocted his own way of achieving his mercy by moulding the image of clay and training in front of it. In fact, the mind of Ekalavya was tainted by the desire to become a famous, skilful archer. He wanted to surpass Arjuna's dexterity in bowmanship. This was not at all a good attitude, especially if we consider Arjuna's status as a pure devotee of the Lord. The desire to be "bigger" or more famous than another Vaishnava is not devotion at all. This was also against the desire of Dronacharya. Therefore, Ekalavya committed guru aparadh by neglecting Dronacharya and Vaishnava aparadh by being envious of Arjuna. This is perhaps the reason why later on Ekalavya was killed by Krishna and merged into His brahmajyoti effulgence. This is the way Krishna deals with the demons. They achieve sayujya mukti, the liberation that is always despised by devotees. Ekalavya's dealings with Dronacharya were also tainted with impersonalism. He really did not take the instructions of his guru to heart. Instead of following the directions of the living guru, he used his guru's clay image as a means to achieving his own cherished ambition. Ekalavya tried to draw his guru's attention to himself instead of surrendering to his guru. This shows that his devotion was artificial. In other words, he outwardly showed the behavior of a disciple, but his heart was consumed by egotism. Similarly, one should not have the outward dress of a Vaishnava while harboring the attitude of a mundaner. Penances without the sanction of the guru and the Vaishnavas do not fall in the category of bhakti. Materialistic people with a demoniac mentality also perform many austerities, but their aim is to get material benefit and enjoy sense gratification. Although Ekalavya was not interested in gross sensual pleasure, his austerities had not been sanctioned by any senior authority. Thus the expert Dronacharya was able to detect that his devotion was mere pretense. For these reasons, therefore, Ekalavya's example is a dangerous one, particularly for beginners on the path of bhakti. Remove Ekalavya from our hearts We are living in difficult times. We have to face many problems even in the association of other Vaishnavas. Senior members of our Gaudiya Vaishnava community are somewhat puzzled by the nature of these problems. They too confess that they have no idea of how to bring about positive solutions. The subject matter is very intricate and requires more analysis. What must be done? It is true that if we stick to the instructions of our guru, Krishna will remove the ghost of Ekalavya from our mind. We must surrender and if we are sincere, the Lord will accept our service. We should not be Vaishnavas in name and dress only. We should stop thinking and acting like Ekalavya. We have to become saragrahi Vaishnavas, not just worshipers of the form like Ekalavya. In the words of Srila Sridhar Maharaj we have to dive deep into reality. Lochan Das Thakur stated that we are just chewing a piece of dry wood instead of sugarcane. ikhu danda bhavi katha cunili man kemone paibi meoha How will we taste the sweetness of the sugarcane juice by sucking on a piece of dry wood? Sugarcane looks like dry wood but is sweet and tasty. Vaishnavas in name or dress may put on many programs, but are not able to inspire pure devotion in others. Vaishnavas who are externally oriented are always busy building more temples and expanding their religious organizations. Unfortunately, they have little or no time to cultivate devotional practices such as hearing and chanting in the association of other devotees or counselling devotees in how to strengthen their faith. If we chew the dry wood of false surrender, how can we taste the sweetness of bhakti? Srila Bhaktivinoda Thakur explained the symptoms of surrender in Saranagati: dainya, atma-nivedana, goptritve varana avasya rakhibe krishna visvasa palana bhakti-anukula matra karyena svikara bhakti-pratikula-bhava varjanangikara "The ways of sharanagati are humility, dedication of the self, acceptance of the Lord as one's only maintainer, faith that Krishna will surely protect, execution of only those acts favorable to pure devotion and renunciation of conduct averse to pure devotion." sad-anga saranagati haibe jahara tahara prarthana sune sri-nanda-kumara "The youthful son of Nanda Maharaj, Sri Krishna, hears the prayers of anyone who takes shelter of Him by this six-fold practice." Unless we surrender to Krishna, He will not accept any prayer from us. How then will He accept any service? This is indeed very sad. By nature, we are the eternal servants of Krishna, but as we lack surrender, sincerity, or both, we are unable to serve Him. The sign of sincerity is accepting that Krishna comes to us through our guru. All scriptures confirm this. My spiritual master, His Divine Grace Srila Bhakti Promode Puri Goswami Maharaj, told me that so-called freedom is detrimental on the spiritual path. We should not detach ourselves from the desire of guru and Vaishnavas as Ekalavya did. We should not try to establish moral codes other than surrender to the will of guru and Krishna. We should not feel envious of others' opulence as Ekalavya did with Arjuna. The example of pretentious devotion set by Ekalavya can infect the heart of any aspirant on the spiritual path. Devotion to guru and Krishna should never be performed with an aim to achieving material benefits. Therefore, we have to keep very alert and remove the weeds of unwanted desires as soon as they sprout. In conclusion, I request the readers of this piece with folded palms to excuse all my offences and bless me so that I may become a true disciple of my Gurudeva and a true servant of all the Vaishnavas. Sri Srimad Bhaktivedanta Narayana Maharaja GURU TATTVA: REAL AND APPARENT (Moscow, July 30, 2000, am) I offer my humble obeisances unto the lotus feet of my spiritual master, Om Visnupada Sri Srimad Bhakti Prajnana Kesava Gosvami Maharaja; and the same thousands and thousands of humble obeisances unto the lotus feet of my siksa-guru, Om Visnupada Sri Srimad Bhaktivedanta Svami Maharaja. Just now we have finished singing the kirtana, 'sri guru-carana-padma, kevala bhakati-sadma vando mui savadhana mate'. What is the meaning? We should try to understand the meaning and realize what Srila Narottama dasa Thakura is telling here - how he is giving honor and how he is presenting his mood to his Gurudeva. 'Sri guru-carana-padma, kevala bhakati-sadma.' Syamarani should explain. Syamarani dasi: 'Sri guru-carana-padma, kevala bhakati-sadma.' In this song Srila Narottama dasa Thakura is glorifying his Guru Maharaja, Sri Lokanatha dasa Gosvami, and all the gurus in the guru parampara. With one's carana, with one's feet, one takes steps. So our immediate diksa and siksa gurus are the first steps to our connection with the entire guru parampara. Sri guru-carana-padma, kevala bhakati-sadma. Sadma means 'abode', and kevala means 'only'. He is the only abode of bhakti. Of what kind of bhakti is he the abode? There are three kinds of bhakti: sadhana-bhakti, bhava-bhakti, and prema-bhakti. And of what kind of prema-bhakti is he the abode? 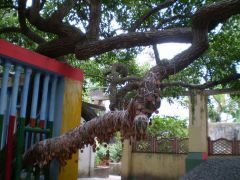 Madanakya maha-bhava. This is the highest possible prema, and the only prema by which one can serve Sri Radha-Krishna Conjugal. People wonder about the omnipotency and omniscience of the bona fide guru. Here, Srila Narottama dasa Thakura is leaving no doubt about his omnipotency. By his mercy alone one can become free from millions of births of past sins and offenses, and can cross over the ocean of material existence and obtain the abode of Krishna. Srila Narayana Maharaja: You should understand who is a real guru. He is the abode of bhakti, and he has all kinds of serving moods towards Radha-Krishna Conjugal or Mahaprabhu. He can give sadhana-bhakti, and he can also give rati - a high class of rati. If he is qualified to even give prema-bhakti in Goloka Vrindavana, and the love and affection of Conjugal Radha-Krishna, can he fall down? Never. How much qualified must that guru be, that he can take all ignorant persons to Krishna? If he himself is falling down, then he is actually not guru. You are intelligent enough to reconcile all these things, and to understand who is the real guru. The scriptures, especially Srimad Bhagavatam, have told, 'tasmad gurun prapadyeta…' What is the meaning? The bona fide guru can give conjugal love to Sri Sri Radha-Krishna. He will be expert and realized in the moods of all the Vedas, Upanisads, Srimad Bhagavatam, Gita, and all Puranas - everything. He will be expert in all kinds of knowledge, and he will have realized all that knowledge. In addition, he will be detached from worldly desires and sense gratification. He will only be engaged in serving Krishna with all his senses - with body, mind, soul, mood, and everything. He is the abode of bhakti and he has no doubts. No doubts at all. Also, he will never go to all these atheistic universities. Never. Why? He has full confidence in his Guru's words, and therefore he will join Srila Haridasa Thakura's University - by always chanting and remembering. A person like this has full faith in the Name, full faith in his guru's words, and he has full faith in the words of scriptures like Srimad Bhagavatam. How can he join these universities? What would be the use? These universities are nonsense and, in the words of your Gurudeva, their teachers are rascals. Why should we join them? These universities are like slaughter-houses and they are full of mayavadis. Srila Svami Maharaja came and cut down all the arguments of the mayavadis and nirvesesavadis. Why should his disciples join all these things? It is because they have no faith in their Guru's words, and because they themselves are not guru at all. They are fallen from the beginning. There is no position from which they would fall down. Those who cannot chant the Name day and night, those who cannot realize what is the mood of the gopis, the Vrajavasis and Krishna, and those who are not engaging all their senses in the pastimes of Krishna, are actually not guru. They have no qualification to be guru. They cannot help us. They cannot take us to Krishna - never, never and never. Now we see that persons who had previously taken shelter of a very bona fide Guru, an actual Guru like Srila Bhaktivedanta Svami Maharaja, are now giving him up and are going to Radha Kunda to associate with sahajiya babajis there. These sahajiyas are still greater rascals. They cannot take anyone to Krishna because they are not following the principles of bhakti. They are not detached from worldly desires and sense gratification, they are living with widows and engaging in immoral activities. How can they help real devotees? In this way you should consider what are the qualifications of a guru. It has been told in sastra that we may have selected any guru before knowing all these qualifications, and thus knowingly, unknowingly, or in ignorance, we have accepted a guru who is not actually guru. Therefore, after hearing from a siksa-guru, from other gurus, and from scriptures, we should decide whether what we have done is wrong or right. If it is wrong, we should give up that guru and come to a realized guru. He can then help you, and you can develop your Krishna consciousness; otherwise it will never be possible. If these bogus gurus cannot give bhakti, then how can such a fallen guru, who is now coming in the bogus ritvic system, help devotees? Fallen gurus are now becoming ritvics. You should do pranama to them from very far away. Don't mix with them, and always boycott them. The ritvic system cannot help because it is only related to performance of sacrifices. [in Srila Narayana Maharaja's The True Conception of Guru Tattva it is stated: "Beginning from the Vedic period up to Dvapara-yuga, it is seen that many great emperors have obtained their desired fruits by flawless performance of sacrifices… Generally; all of these sacrifices were performed for fulfilling material desires, the chief of which was the attainment of heavenly planets… After the completion of yajnas, the yajman (employer) pays the appropriate remunerations to the ritviks and sends them away. The yajman and the ritvik have no mutual eternal relationships."] In our line there is guru, there is siksa guru, there is caitya guru, there is sravana guru, there is patha pradarsaka guru - so many gurus. Why go to these bogus ritvics? Be very far away from them. Be careful about them. We should be very careful about mayavadis, sahajiyas, and all nirvesesavadis. You know that in our guru parampara line Brahma has never fallen down, Narada has never fallen down, and Sri Vyasa and Sri Sukadeva Gosvami have also never fallen down. You know Madhavendra Puri and Isvara Puripada; they never fell down. You know that Srila Rupa Gosvami, Srila Sanatana Gosvami, Srila Jiva Gosvami and all the other six Gosvamis, Srila Krishnadasa Kaviraja Gosvami, Srila Narottama Dasa Thakura, and after that Srila Visvanatha Cakravarti Thakura, Srila Bhaktivinoda Thakura, Srila Prabhupada Bhaktisiddhanta Sarasvati, my Gurudeva Om Visnupada Sri Srimad Bhakti Prajnana Kesava Gosvami Maharaja, and my siksa-guru Srila Bhaktivedanta Svami Maharaja - none of them ever fell down. They cannot fall down. They are actual gurus. One should select a guru like them. However, even if you have not as yet done so, you can think about it more and more. We have not come for joining any society. We have come to serve Radha-Krishna Conjugal and Mahaprabhu. This is our aim and object. Why remain where the object is not fulfilled? Srila Svami Maharaja came with a mission, and at that time the mission was fulfilled in all ways. All joined, but those who neglected his teachings fell down. We should try to know all these truths. 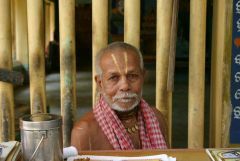 The real guru is an uttama maha-bhagavata - like Narada Gosvami and Sukadeva Gosvami. They can hold up their hand to bless you with the words, "Bhakti should come at once." And bhakti will come. There are three kinds of uttama bhagavats. The first is Narada in his first stage (in his previous birth, after Lord Visnu gave him His momentary darsana). He realized Krishna in his heart, and at once all kinds of anarthas and imperfections disappeared. He realized Krishna, his relationship with Krishna, and his service to Krishna. However, at that time his body was still composed of past activities. He is therefore known as a murcit kasaya maha-bhagavata. What is the meaning of murcit kasaya? There is some imperfection, but it is now sleeping; not active. Sri Sukadeva Gosvami is an example of the second kind of uttama bhagavata. He is nirdutta kasaya. What is nirdutta kasaya? All impurities and imperfections have been washed away. Ignorance and anarthas are all gone. [some devotees were falling asleep, and so Srila Maharaja addressed them.] Srila Narayana Maharaja: Don't sleep please. Hare Krishna Hare Krishna Krishna Krishna Hare Hare, Hare Rama Hare Rama Rama Rama Hare Hare. Sit straight like this, old persons and everyone else, and chant: Hare Krishna Hare Krishna Krishna Krishna Hare Hare, Hare Rama Hare Rama Rama Rama Hare Hare. Chant more loudly. Don't sleep. Otherwise you will lose everything. [Devotees chanted and then Srila Maharaja resumed the class.] The third kind of uttama bhagavata is still more elevated. The example is Sri Narada Gosvami in his second stage, when he attained the body of an associate of Krishna. At this stage he has no mortal body. He has a body to serve Krishna - a siddha sarira, transcendental body. If these kinds of gurus will place hands on anyone's head, or somehow they will glance at anyone and bless him, then prema bhakti will come at once and the disciple will go to Goloka Vrindavana. They are so powerful. You may know that Sri Narada Gosvami has thousands and thousands of disciples: Dhruva, Prahlada, Citraketu, Valmiki, Vyasa, and Rahugana - so many. Just by sprinkling his mercy, they became qualified. And you know Sri Sukadeva Gosvami. Practically everyone in the world was his disciple, but he never initiated anyone. Why? Because he realized that, "All are serving Krishna, but I myself am not." He is a high class of maha-bhagavata. By his mercy, all the persons who were hearing his hari-katha in the assembly of Pariksit Maharaja were liberated and went to Goloka Vrindavana. This is very marvelous; but such gurus are very rare, especially in Kali yuga. What is then the remedy for us? Who will help us? Only the madhyama adhikari. 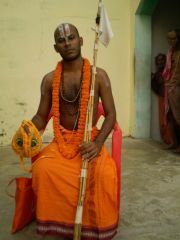 Sri Gurudeva should actually be acting in the stage of madhyama adhikari. "Prema maitri krpopeksa ya karoti sa madhyama." 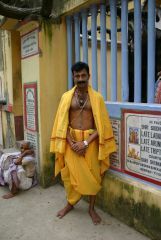 Madhyama adhikaris are of three categories: madhyama kanistha, madhyama madhyama, and madhyama uttama. The madhyama kanistha cannot act as guru. The madhyama madhyama and madhyama uttama can, however, because they are in the line of their guru, always chanting and remembering the pastimes of Krishna, chanting Hare Krishna with rasa and taste, and their anarthas have practically disappeared. There remains only a very little scent of anarthas, and there is no offense at all: no Vaisnava-aparadha, nama-aparadha, seva-aparadha, or dhama-aparadha. They are chanting and remembering, and always in the line of their own Gurudeva. Though they are not so realized, still they can help us. We have these kinds of devotees in this world, and they can help us. But you should know that a maha-bhagavata can descend in the madhyama adhikari stage, and then he can preach and accept disciples. In this way we can accept two kinds of gurus, and they can help us. The madhyama adhikari gurus will take us to the uttama adhikari, and thus the madhyama gurus and their disciples will develop their Krishna consciousness. We cannot say that Srila Bhaktisiddhanta Sarasvati Gosvami Thakura is a madhyama adhikari. We cannot say that my Gurudeva was a madhyama adhikari. We cannot accept that Srila Bhaktivedanta Svami Maharaja was a madhyama adhikari. They were really uttama adhikaris. They have simply descended and accepted disciples - only to help devotees. They can come to the level of madhyama adhikari and then they can preach. Otherwise they cannot preach and they cannot initiate anyone. They are therefore very, very kind. Ordered by Srimati Radhika to fulfill the desire of Radhika and Krishna, they have accepted this position; otherwise they never would have done so. None of the gurus in our line who have accepted disciples are madhyama adhikari. All are uttama adhikari, but they have descended for the time being, for the benefit of the whole world. In sastra it has been told very clearly and strongly what a disciple should do if he has accepted a guru who is not in the line of devotion, who is not a realized soul, and who is not even a madhyama adhikari, and afterwards that disciple realizes that his guru cannot help him in devotion, in the service of Krishna and Radhika Conjugal. If that guru is fallen, not actually chanting and remembering, and if he is not in the line of his Gurudeva, the disciple should give him up at once and accept a real guru. If anyone wants to serve Krishna, and has no other motive than to develop his Krishna consciousness, he should do pranama and say, "O Gurudeva, I want to associate with a high-class Vaisnava. Please allow me." If his gurudeva allows, as did the gurus of Sri Syamananda Prabhu, Sri Narottama dasa Thakura and others, then that guru is a madhyama adhikari. However, if he says, "No, you cannot associate with high-class Vaisnavas. If you do, you will go to hell", then that class of guru is not guru. He is like a kan-guru (kangaroo). He may say, "If you disobey me and go to another high-class Vaisnava, then you will go to hell." I think that such a false guru will go to hell first, and after him the disciple will go. We have come only for this, and some of the devotees who have come to us have left their wives, wealth, and aristocratic families. And so many are very learned. We should think about this matter and try to develop our Krishna consciousness. If you do not follow this process and you do not know all these truths, you cannot develop your Krishna consciousness in lakhs and lakhs or thousands and thousands of births. You will lose everything. So I think that you should consider what to do about this. Bhakti is like a river, a current. No one can remain for twenty or thirty years at the same stage. If we think that we are not developing our Krishna consciousness, we should inquire why our current has stopped. I should realize whether anything is wrong in my guru or in me. If guru is right, then there is something wrong in me, and I should try to repair it. And, if there is a hole in guru, then I should do this pranama to him forever: "O gurudeva, I don't want your mercy. I want the mercy of a high-class of devotee." If a guru does not know the meaning of the mantras, like brahma-gayatri - if he does not know who is the istadeva, deity, of this mantra, if he does not know upon whom we should meditate, who should pracodayat, come in our heart, if he does not know the meaning of gopal-mantra, kama-gayatri, gaura-mantra, and he does not practice it in the morning, at midday, and in the evening, and if he is not realizing anything, how can he be guru? He should realize all these things. If he has bhakti in his heart, he can donate it to others. But if he is not really doing all these things, and there is no bhakti in his heart, then how can he donate that bhakti to others? This is the thing. That is why we are not developing. But for this, the current will go further, further, further to Krishna. I think that now our class-time is over, and I want you to first digest all these things. Tomorrow we will proceed to explain the other lines of that song, "Sri guru carana-padma". Sri Srimad Bhaktivedanta Narayana Maharaja HISTORY OF THE APPEARANCE OF LORD JAGANNATHA (Wales, UK, July 3, 2000) [Just before beginning class, Srila Maharaja gave a short talk on the meaning of Srila Bhaktivinoda Thakura's Introduction to Saranagati.] Sri krsna caitanya prabhu jive doya kori. What is the essence of this song? You should try to hear very carefully - but not only hear. There was once a guru and a cela, disciple. The guru ordered, "Bring me a glass of water. Are you hearing?" The disciple answered, "Yes, I am hearing." But he did not go to bring the water. The guru asked again, "Bring me a glass of water." The disciple heard this order, but he was still not going to bring the water. The guru then asked the disciple, "Why are you not bringing the water?Because you only asked me, 'Have you heard?' There is no need to be telling me so much; I am not deaf. I am hearing what you want." This is not hearing. You should not hear like this. If you want to follow me, then bring me water. Gurudeva says, "O, have you brought water?Yes.From where have you brought it?I brought it from there.But it is not drinking water." Suppose it was a very cold day and the disciple brought very cold water; such a disciple is not a sevaka. He is only a baka. What is the meaning of baka? Crane. The crane stands on one leg, and although he appears to be doing austerities, his austerities are only to catch fish. He will see a fish and say, "Oh!" and catch it. If you are following, then you can hear. When you are doing kirtan, try to think of the meaning of the song and follow it. Then all your problems will go away and you will be happy. There was a dog, and he surrendered himself to his master. 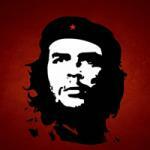 His master was very powerful, very rich and wealthy, and he had two or three guns and pistols. The dog had nothing to do for his meals or anything else. He had no pocket at all. Dogs, and those who have surrendered, have nothing to care about for their meals, for their sleeping, or for their anything. Whenever he went for a walk, his master also went with him. Once, on the way, there were some large and ferocious hound dogs. They wanted to attack him, but he did not fear. Why? Because he knew his master had some guns, and if they would come and attack, what will he do? Shoot. So that dog was jumping and also going to quarrel with them. Why? Because he knew that his master was carrying guns. Similarly, if anyone is surrendered to Krishna, he will know that Krishna is very powerful and thus he will be always happy. He will not have to maintain his life. His maintenance will also depend on Krishna, because he has fully surrendered. In all ways, therefore, if any devotee surrenders by the six limbs of saranagati, (accepting everything that is favourable and rejecting everything that is unfavourable, having firm conviction that Krishna is his only maintainer and protector, having humility, and fully surrendering), why should he be worried for his maintenance or anything else? He will cut off his pocket, and he will cut off all his attachments to anything other than Krishna. This dog, however, is not fully surrendered. The master has some chains. Why does he have chains? Although the dog is surrendered in so many ways, there is some defect. If he will be free from his chains, where will he run? To she-dogs. He will then forget his master and go there to enjoy. Therefore the very powerful master is also very clever and intelligent. Sometimes, at night, he lets him free to do night-guard. That dog was not worried at any time for his meals and other things, but if he were not chained, there would be something wrong -- because he is not fully surrendered. Devotees, however, are superior to that dog, and they should at least be like him regarding their meals, their maintenance, and their bhakti. Everything will depend on the master, and the master is not ordinary. He is Krishna Himself, all-powerful and very merciful. He will protect you, save you, and give you anything you desire. If you are a surrendered soul and still worried about your maintenance, then there is no real saranagati. A person may seem to be surrendered, but when any trouble or sickness comes, he will call out, "Oh, save me! Save me!" to persons other than Krishna. Krishna is so powerful. He can dissolve all your problems. Why worry? If a devotee is like this, always chanting and remembering, he will be always happy. Jayatma samprasidati. If one is doing bhakti he must be happy forever, and therefore he will certainly be detached from worldly desires. This is because he has some taste. Suppose there is sugarcane and a rasagulla. The rasagulla is saturated with a high-class of rasa and a very sweet fragrance. Everywhere it is saturated with rasa. Will a person take the sugarcane or the rasagulla? Param drstva nivartante. (One who experiences a higher taste will naturally give up the lower taste.) Bhakti-yoga means rasa; transcendental rasa. If one is tasting that, why will he be attached to worldly things? He will never be. If you are chanting, remembering and advancing in Krishna consciousness, there will be no problem. Detachment will come and you will be always happy. At present you are doing all things, but you are always very unhappy; very unhappy. Detachment from wordly desire is not coming. You want to collect all those nonsense things that rascals are collecting. What does this mean? There is no bhakti at all. You are cheating yourself, your Gurudeva, and Krishna. Actually, Krishna and Gurudeva cannot be cheated; they will never be cheated. Only you are cheated. Bhakti is like a current. It should not be stopped. It should be flowing, flowing, flowing always. Otherwise the water will stagnate and become stale. Bhakti begins from sraddha, nistha, ruci and so on. It is always developing. As much as it will develop, all the qualities of a Vaisnava will come. Detachment from worldly things will also come and you will be much more happy. THE RATHA-YATRA FESTIVAL Today is the ratha or cart festival. What is the cart festival? Our heart is like a cart. Pray to Krishna that, "You should come and sit in my heart." The gopis were praying like this to Krishna in Kuruksetra: "You should come and sit in our heart. Our heart is Vrindavana." From where does this upakyana, history, come? There was once a King named Indradyumna, and his wife was Gundica. He heard from devotees who had been here and there in all the holy places, and who for one night were residing in his kingdom, about the glories of Nila Madhava. He heard that if anyone has darsana of Nila Madhava, he will certainly be liberated and go to Vaikuntha. The King wanted to ask, "How can I reach Him?" They left during the night, however, before he could ask the whereabouts of that Nila Madhava. The King decided to somehow search for the Deity. He called his priest, or rather the son of his priest, Vidyapati, who was very intelligent. He also called all his officials and commanders, and ordered them to each go in a different direction. He said, "One will go to the east, another to the west, another south, another northeast, another southeast, and so on. In this way he sent them 'to all four corners', up and down, in all ten directions, and told them, "You should return within three months. To he who will really search, and will tell me the whereabouts of the Deity, I will give so much wealth and position." He sent his priest´s son, Vidyapati, who was very young and very beautiful, and possessing all good qualities, to the east. They all started from Madya Pradesh, and he would be going to the eastern side. After three months all returned except Vidyapati. The king was worried; no one could find out his whereabouts. What was Vidyapati doing? He was travelling continually, up to the ocean, on the east side. One day, while he was searching Nila Madhava, he saw a very beautiful village on the bank of the ocean, and a mountain with so many flowers and trees. The persons there were very high-class. It was now approaching night, and he wanted to stay in that village. He went to someone and said, "Tonight I want to rest somewhere." That person told him, "The commander of this village, Visvavasu, though a sudra, is very qualified. You can go to his house. 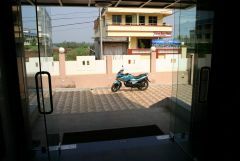 Whenever any traveller or guest comes, he goes to his house. He is very humble and very liberal. You must go there." 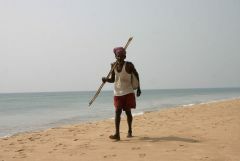 When Vidyapati arrived there, he saw that the owner was not at home. Only his very beautiful 16 year-old daughter was there. She opened the door and said, "You can wait for my father. He is not here. He has gone out. He will come, and then he will arrange everything. So you should wait outside." After some time -- after two, three, four hours -- the father of the girl arrived. A very beautiful, sweet fragrance was coming from his body, and he was wearing very beautiful and fragrant tilaka. When he saw his guest he became ashamed and told him, "Oh, excuse me; I am late. Now you can come." His daughter also came. They both took that guest inside and said, "The arrangements are made for all things -- bath and everything." He took his meal and rested there, but he was thinking, "Where did that beautiful fragrance come from? I have never smelled anything like that in my whole life. And that girl is also so beautiful." Vidyapati was also a very beautiful young man, and the girl became attached to him. Her father therefore told her, "You should take care of this young boy. He is very beautiful, intelligent, and qualified, and he is a brahmana by caste. So you should take care of him." The next morning her father again went out to the same place. He told his daughter, "Do not tell anyone where I go. Keep it secret -- very, very secret. In the evening he again returned, very fresh and very fragrant. After some time, Vidyapati began to have so much love for that girl. He was married, but still he had so much affection for her. He was so attached that he requested her father, "I want to marry this girl." The father agreed to marry his daughter to him, and now he became his son-in-law. One day Vidyapati secretly told his wife, "O, I want to know where your father is going daily, and from where is this fragrance is coming. Tell me.That I cannot tell.You cannot tell me? You are one with me; you are non-different to me. You must tell me. I am your husband.Then you must promise that you will not tell anyoneA wife should not speak like this. I know you are a very chaste wife, so you must tell me." Then he was silent. "I will tell you," She said, "He is going to worship a Deity." "Which Deity?I promised not to tell, but yet I will tell you because you are my husband. He is going to Nila Madhava." Hearing this name Vidyapati became very happy, and he began to show his love and affection to his wife in such a way that she told him everything: "My father goes in the morning, comes in the evening, and again goes." Then he asked, "Can you tell me in where he goes? Request your father that, 'You should take your son-in-law with you.'" That night, when her father returned, she requested him: "Father; O father. I want that you take my husband with you to Nila Madhava. He wants only to take darsana." When he was not willing, she said, "I will take poison. I will die in front of you if you do not take him with you. This means that I am not your loving daughter." She became ready to take the poison. These are the most powerful weapons of ladies: "I will die. I will take poison. I will commit suicide." What, then, will a husband say? "Oh, you can take my everything." This is most powerful. Her father said, "No; I do not want you to die. I will take him with me, but there is some condition: I will bind his eyes with black cloth." She told him, "Yes, you can bind his eyes with black cloth." When Vidyapati was seated on a bullock cart, Visvavasu put on the black cloth and took his son-in-law with him. Vidyapati's wife was very clever and also very intelligent. She had given him some mustard seeds and said, "Keep this in your pocket. Now it is the rainy season. If you will drop one-one-one-one, one after another, the whole way, after some time the plants of those mustard seeds will blossom into bright yellow flowers, and you will very easily be able to go there yourself. You will not have to ask your father." Vidyapati took the mustard seeds, and one by one began to drop them on the ground -- and his father never knew. [At this time Srila Narayana Maharaja noticed some devotees sleeping and said] Don´t sleep. Who is sleeping? Don´t sleep. Sit like this. Always keep your eyes open. When sleep comes, clap. Maya comes especially at the time of chanting Hare Krishna. She becomes so heavy on your eyelids; it is as though 1000's of mounds of stones are there. Maya is very powerful. I have come from so far to give you all these things, and you don´t want to take the nectar. So I will take my nectar and I will return. [He then resumed the class.] When they arrived at the foot of the mountain, the bullock cart was kept there. Visvavasu took Vidyapati by the hands and brought him to the top of the hill. When they went inside the temple he took off his black cloth and saw the very beautiful Nila Madhava. He was four-handed, and carrying sankha, cakra, gada and padma. He was very beautiful but, unlike Nanda-nandana, He had no flute and no peacock feather. Nila Madhava was like Narayana. Narayana is not less beautiful. He is very beautiful, but Krishna is supermost. In this way Vidyapati saw him, became so much happy, and began to weep. His father-in-law told him, "Wait; I am coming. I am going to pick some flowers and get other paraphernalia. You should wait here." While he waited, he noticed a very beautiful lake with lotus flowers, humming bees, and some sweetly singing birds. The branches of a mango tree were hanging over the lake, and a crow was sleeping on the branch of that tree. While sleeping, the crow fell down in the lake, and at once he left his body and became four-handed. Then Garuda quickly came, took him on his back, and they both went to Vaikuntha. Vidyapati began to think, "Oh! Then why should I remain here?" He wanted to also climb a tree, jump in the lake, and thus be four-handed and go to Vaikuntha. When he began to do so, an aerial voice came and said, "Do not do this. No. You will have to do so many important things for the benefit of the whole world; so do not do this!" Thakurji also told Vidyapati, "O, don't commit suicide for becoming liberated and going to Vaikuntha. You should be patient. Everything will be done." 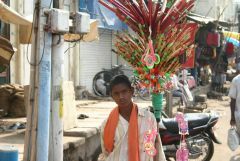 In the meantime Vidyapati's father returned with so many flowers and other paraphernalia. He said, "Why you are doing this? You should not do this!" This boy was now very much charmed with the glories of Nila Madhava. His father made candana and other things, and throughout the entire day he was worshipping, offering prayers, and engaging so many other devotional activities. Visvavasu was known a dayita-pati, and all the residents of that village were known as dayitas. Dayita means those who are very near and dear to Krishna; very near and dear. Visvavasu was dayita-pati, master of all those who are near and dear. Although he was a sudra, still he was serving in this way, fully surrendered and always calling out, "Nila Madhava!" When his services were completed, he again put the black cloth on the eyes of Vidyapati and they both left. Visvavasu then practically arrested him in his house. He could not go anywhere, and thus it was as though he was in jail. He told his wife: "You should help me. I want to return very soon. I have promised my king. The king wants to come with his whole family to serve Nila Madhava. Please help me. You are my wife; my half." She gave permission and said, "You can go. I will help you." She somehow made a plan, and he thus came out of his jail and proceeded towards the place from which he had come. Vidyapati had been gone for six months or more, and now that he returned the king became very happy. The king decided," I must go with my wife, my kingdom, my wealth, and my soldiers and commanders. Proceeding, he reached there in six months. From where? From Sandipani Muni in Ujjain. He was the king of Ujjain, and from there he travelled to Puri, or rather a hundred miles south of Puri. By a miracle, however, he saw that the hill was not there, and there was also no village. 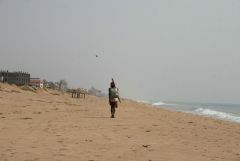 The entire village was covered with over a hundred feet of sand. Everything was covered up to the hill, and Nila Madhava was not there. Then the king began to fast. He took a kusasana, straw mat, and, facing the ocean, he decided, "If I do not get have the darsana of Nila Madhava, I will not take anything to eat and I will die. I came with my whole kingdom, my whole wealth, wife and family, but I did not get the darsana of the Lord. Oh, I must give up my life". An aerial voice then said; "He will not come, but do not worry. Nila Madhava will not be here to give you darsana, but you will be able to see Him. He will manifest in four forms, but now wait. I am sending Brahma. You should come with Brahma to Vaikuntha, and there you can take darsana of Nila Madhava. But Nila Madhava will not go to this world. His four amsas, manifestations, will go." Brahma quickly came and took the king with him to Vaikuntha, where he could glance at Nila Madhava. He became very attached and began to weep. 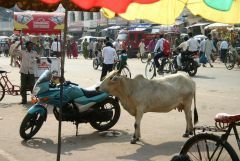 Brahma told him: "Let us go. He will not go to earth in this form, but He will go in four forms: Jagannatha, Baladeva, Subhadra and Cakra Sudarsana. So we should go there and wait for him." In the meantime, while the king was gone, so many years had passed, and now the whole world was changed. Before going he had made a very big, beautiful and high temple, but now it was also covered. Although the sands had been taken off many times, still it became old and dilapidated. A new king had come and repaired it, and he had declared, "I am the builder of this temple!" When King Indradyumna returned, however, he said, "This is not yours. I have built this. I am the owner of this temple. You have only made repairs." Brahma agreed, "This King has built the temple. You have only repaired it." In this way, King Indradyumna again became the master. They were now all waiting for the Deities. Somehow the king's wife was there by the mercy of Krishna. He had no child at all, so there was only he and his wife. While waiting, he heard about Bahki Mahana, somewhat north and east of Cakratirtha, on the shore of the ocean. Going to that placethe king saw a red tree-trunk which was marked everywhere with sanka, cakra, gada and padma, and conch, disc, club and lotus flower. He thus went there with his soldiers and elephants, and tried very hard to take it out of the water; but he could not do it. At last an aerial voice said: "You should bring Vidyapati, your priest´s son, and dayita-pati -- those who first served Nila Madhava. And also bring his daughter." They were thus brought with honour on a chariot, and then Dayita-pati and Vidyapati and his wife began to pray to those logs. "O, please, please be merciful and come on our chariot." The logs now very easily came, and then they were brought to the place near to where the temple was situated. A big sacrifice was then performed, and I have already explained how these four vigrahas were manifest there. The Deity ordered the king through an aerial voice, "You should make a festival for ten days, beginning from today. You should take this chariot to the Gundica Mandira and we will be there for so many days. Then you should take us back. You should perform many festivals like snana-yatra, candana-yatra, hera-pancami, and so on." During candan-yatra Jagannatha's whole body is covered with candana for many days. In narendra-sarvovara lake a very beautiful boat comes, and then His Deity of Madana-Mohana is brought there and nokara vilasa, boat pastimes, take place. Then comes snana-yatra. The Deity receives abhiseka, bath, from thousands of pitchers of water brought from all the holy places. He takes such a long bath that he becomes sick. His stomach becomes upset and loose motion comes. At that time Laksmiji takes Him to Her palace and closes the door for fifteen days. Sri Caitanya Mahaprabhu cannot survive without Him, so He goes to Alvarnatha and cries, "Where is Krishna? Where is Krishna?" He becomes mad. He became so mad that when He touched the stones at Alvarnatha they melted. Wherever He did his pranams, wherever His hands, head, and other limbs were placed, their impressions became visible in that piece of stone. It is still kept there, and it is called angavasat. Only the dayitas can serve at that time; no one else. Who are the dayitas? 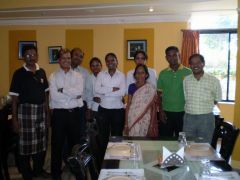 The family of Visvavasu Sabara. Only they can become the servants of Jagannatha. Actually there are two kinds of servants. One is coming from the dynasty of the original brahmana wife, Vidyapatis first wife. These devotees will do arcana and seva. Those who descend from Lalita, the daughter of Visvavasu, are called supa. Supa means cook. Though they are of a very low-class of birth, Jagannatha has accepted them and they can cook. They cook not less than one hundred mounds of rice and dal, and so many various preparations -- very easily and very quickly -- and they are expert in using the many stoves. At least twenty-five earthern pots can be placed on one stove. The king prayed, "O Thakuraji. I am serving you. I want a boon.What boon do you want?I want that in my dynasty there should be neither sons nor daughters. I do not want any child. I know that you will give what I want.Why don´t you want children?They will quarrel for money. They will have no interest in serving. So much money will come and they will think, 'This property is mine' 'Jagannatha is my property.'" 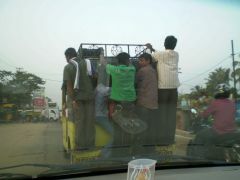 Nowadays we see this all over India, and everywhere else. The disciples of my siksa-guru also think, "This is my property." The King continued, "So I do not want that any one of my family members thinks 'Jagannatha, Baladeva and Subhadra are my property, and all money that is coming as pranami is therefore mine to enjoy.'" These days devotees go to others and tell them, "Give me some money to serve my Gurudeva. I want to serve Thakuraji, Jagannatha, Baladeva, and Subhadra. I want to serve Radha and Krishna. So donate something." Then, when they get that donation, they do not give a single percent to Gurudeva or to Thakuraji. They think, "Now I am the enjoyer!" and they keep the money in their pockets. Then they think, "Where is the bank so that I can make a deposit?You can go to Switzerland, it is the very best.No, I want to keep it in India because I want to live there. So can you tell me which is the safest bank in India to keep my money?" They forget that they collected this money for Gurudeva. Would anyone give the money if they thought it was for you? And what will be the punishment? As yet Krishna has no hell that is good enough to give. He will have to create a new hellish planet where such persons can suffer even more. Krishna is therefore somewhat worried about where to make such a hell for them to be sent. This is a very big problem for Krishna. So you should be always careful about this. Otherwise bhakti will not come. She will know that, "This person is very selfish. He wants to be the master of his Gurudeva and Krishna also." The king therefore requested, "I want that in my family there should be no child at all who will say, "I am the owner. I am the master of Jagannatha, Baladeva and Subhadra", and who will take even a single paisa. The managers should always be changed. There should be a servant, like a trustee. What is a trustee? He who you can trust to serve without any self-gain. 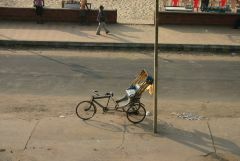 The king of Orissa is always the trustee, and he has no child. After him someone else is selected. They are not actually king. They cannot take even a farthing or a paisa. If they will take anything they will be ruined. The king then said, 'The dynasty of Vidyapati´s first wife will be the priests, and the dynasty of his second wife will cook. 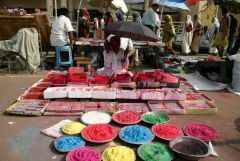 They will especially serve during the ten days of ratha-yatra. Nobody besides them can serve. There are so many teachings in this. This evening I will tell you about Prataparudra Maharaja; how Caitanya Mahaprabhu rejected him and how he then accepted him due to his bhakti, and what was going on between Svarupa Damodara and Srivasa Pandita when Mahaprabhu was the mediator. So many questions were raised and Sri Caitanya Mahaprabhu solved them in a very good way. If you hear this, you will get the benefit of hearing the whole Srimad Bhagavatam and the essence of the whole Vedic literature. Love and affection will come, and thus your life will be successful. That is why my siksa-guru, Srila Bhaktivedanta Swami Maharaja, took this cart festival here, there and everywhere -- because in the beginning we are only qualified to serve Jagannatha. He is patita-pavana. So you should discuss all these teachings and try to listen and follow them, and you will very quickly become a high class of devotees. There will be no doubt at all.